Maze Runner was all about a group of kids trying to escape "the Maze". 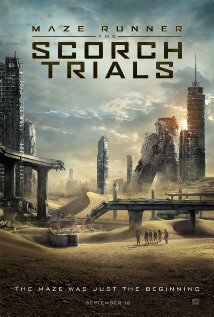 After achieving the unthinkable, they now face their next challenge, the Scorch. The Scorch Trials is basically going through the desert and the heat it comes with. The Gladers also face who they thought were the good guys at the end of the first, but were revealed to be the same people who put them in the maze, the organization called WCKD. Knowing this, Thomas (Dylan O'Brien) escapes with Minho (Ki Hong Lee), Teresa (Kaya Scodelario), Newt (Thomas Brodie-Sangster), Frypan (Dexter Darden), Winston (Alexander Flores) and a few new comers into the Scorch to find out what WCKD is all about. They also question what to do should they survive the Scorch and wonder about those infected with the Flare Virus who are just as dangerous as WCKD. Throughout the film, Thomas gets flashbacks of his early work with the WCKD and the reasons why he was sent into the Maze in the first place. Another key person also gets their memory back but when said person does, it effects the rest of the group in a negative way. Action and mystery are what grabbed me in the first movie and this flick does the same. If you had any questions of what was gonna happen next and the whole story with WCKD, Scorch Trials answers them and more. You will see more characters who are key figures in coming sequels (so far there are four books and from what I read a fifth is coming in 2016). The story must be great enough to have so many books and the actors bringing these characters and world to life are fun to watch. Don't go to Scorch Trials if you haven't seen Maze Runner. A friend of mine didn't and was confused with the story so watch the first before you go. Scorch Trials was fun, entertaining and one that you will enjoy!